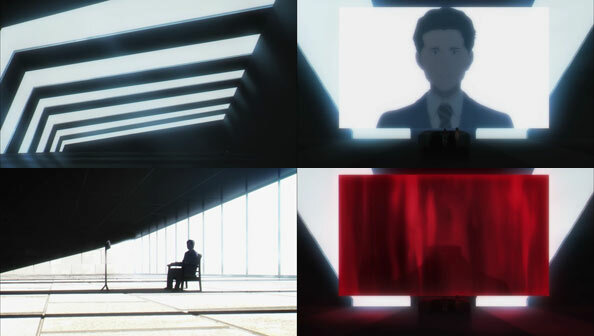 While this week continues to check in with various parties affected by the King of Distortion, the consistent through line is that of Kentarou and Shirou, some of the first in the building to wake up, and the first to start investigating what the heck is going on and how to end it. They come across Sakiko and wake her up, which like so many other events is probably meant to happen (after Ken teased her earlier). But Sakiko had a very different experience in her personal dream world, and doesn’t share Ken and Shiro’s desire to “defeat” the King. So when they find what could be a maintenance hatch and climb down to investigate, she locks them down there and tries to find a way back to Hinako. Not long after, the Moon Temple turns black from the outside, and Taratsuki’s voice announces to anyone trying to get in that they shouldn’t bother, and to anyone inside that their supply of air has been cut off. 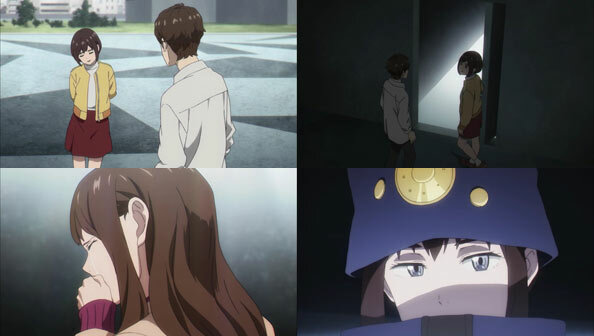 Outside, Keiji encounters Touka, but she’s neither the real Touka nor Boogiepop (Yuuki Aoi has a lot of voices in this show and they’re all great). She’s the King of Distortion, and leads Keiji into the temple via a “staff entrance”, where she runs and urges Keiji to follow. 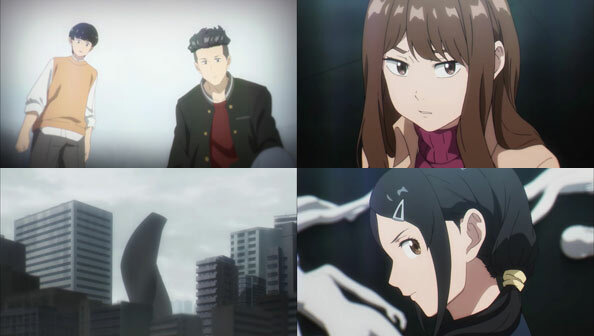 Just as Kei figures out something of what the King of Distortion really is, and thus why he resembles Saotome to her, the real Boogiepop saves Sakiko from a falling ceiling tile and introduces themselves. Boogiepop confirms that they do kill people, but only those deemed enemies of humanity. Sakiko wants to know why she doesn’t qualify; she’s a “terrible, horrible person” in her own words. The world should be full of only good people like Hina-chan. But Boogiepop tells Sakiko the Hina in her dream world isn’t Hina at all, but part of herself: in her case, her kindness. For years since her transgression, pain and anguish have built up and been borne by Sakiko’s heart, and is proof of Sakiko’s underlying kindness. If Sakiko was truly an enemy of humanity, doing awful things wouldn’t cause her any pain whatsoever. Boogiepop determines that the King lacks a body, and so takes the form of the distortions in peoples’ hearts. They then lament that things aren’t going to end so easily. Ken and Shirou reach the temple’s control room (or something akin to it), a massive, sparse space with grand arcing windows; their arrival is a wonderful extreme wide shot that continues to establish how vast the temple is. When Ken starts fiddling with the control panel, it triggers a giant monitor that plays a message by Teratsuki Kyouchirou. What’s strange about this is that we cut to Teratsuki filming the message, suggesting we’re either glimpsing the past, or he’s filming it live. He certainly has a lot to say: He’s a synthetic human developed by the Towa Organization to manipulate the economy, but he’s evolved beyond their control and doing what he wants, even though that puts a target on his back. Teratsuki isn’t aware of who’s watching, but deems whoever has gotten that far to be a potential enemy to Towa: a person who can understand things or go places most cannot, nor should. In other words, free, powerful minds. He used the remainder of the “real” late Teratsuki’s fortune to build the Moon Temple, a means of luring the kind of people who could challenge Towa’s desired hegemony. Before his head is hacked off by a puff of black smoke he calls “Eugene”, Teratsuki tells his viewers to enter “STAIRWAY TO HEAVEN” to end the temple lockdown, and wishes them well. Ken is as confused as ever, especially since Teratsuki said nothing about any King of Distortion. A blank-eyed Shirou, on the other hand, seems to have come to some kind of realization. What that realization is, whether he’ll be so kind as to explain it to Ken (and us), and the connection between Towa and the King, will be a matter for next week’s episode.